To keep your eyes and vision in top shape, optometric experts recommend that you have a comprehensive eye exam performed yearly. In line with this, we encourage all of our patients to come in for regular eye evaluations at our Longview, TX office. It doesn’t matter how old you are, (from infants to golden-agers) or what physical condition you’re in, routine eye examinations are the best preventive care for your eyesight! Many common ocular diseases and vision conditions may have no symptoms, especially at the early stages. 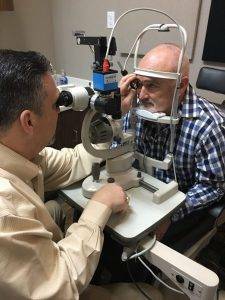 Our gentle and thorough eye exams, provided by Dr. August Wallace will inspect your inner eye tissues and retina for signs of any abnormalities. By identifying problems before they impact your vision, you’ll be able to begin treatment immediately, which greatly improves the success rate of preventing future vision loss. Pediatric eye examinations are particularly important, as they may detect a vision condition that could cause learning delays or difficulties in school. Eyes also provide us with a look at your overall health. When we check your eyes in our Longview clinic, we pay attention to indications of certain medical conditions, such as diabetes or hypertension. Our eye exams assess much more than just your vision. We care personally about the health of each and every patient we see! How is our eye exam different from a vision screening? Vision testing can be done anywhere and is often conducted by a volunteer or nurse. These tests may help identify a need for eyeglasses, yet they cannot detect signs of eye disease. When our experienced eye doctors examine your eyes, every part of your ocular health will be considered. 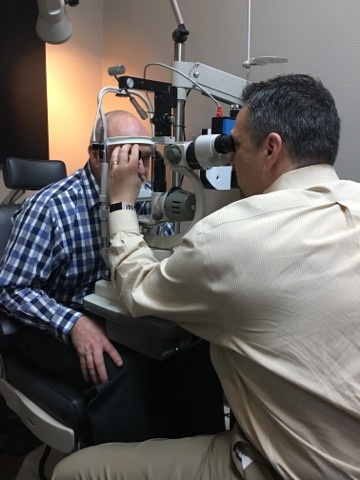 What can you expect during our complete eye examination in Longview, TX? When you first arrive, we will sit down with you and discuss your medical history, including details about current medications, occupational hazards, family eye history and any vision problems you may have. Our friendly eye doctor, Dr. August Wallace will get to know you and your unique needs. Visual acuity testing by reading a basic eye chart, along with an evaluation of your eye muscle mobility, color vision, peripheral vision and depth perception. Our office is equipped with Ultramatic RX Master Phoropter Refracting Instruments, known in the industry as the leading phoropter. We use this technology to help decide the lens power that you need for vision correction to give crisp eyesight. We’ll conduct a cover test, during which you’ll need to cover one eye at a time while focusing on a small object in the distance. We’ll pay attention to your eye movements to detect any misalignment, even slight, that could disturb binocularity and lead to amblyopia (“lazy eye”). Magnification equipment and bright lights will be used to help us assess the health of your external eye, such as your cornea, conjunctiva, eyelids and surrounding tissue. Dilating eye drops will be applied so that we can examine your retina and the tissues at the back of your eye. This is the most effective way to check for diseases, such as retinopathy and macular degeneration. To ensure high accuracy for our patients, we use the advanced Canon retinal camera cr1. When necessary, we’ll map the curvature of your cornea with our quality Topcon kr1w Corneal Topographer, to diagnose conditions such as keratoconus or to achieve a proper contact lens fit. At the end of your complete eye exam at August Wallace Eyecare Associates, we will meet with you to share and discuss the results. If treatment is required, we will work together with you to design the most suitable plan for your lifestyle, health condition, and visual requirements. Click Here to Schedule Your Eye Exam in Longview, TX NOW! To schedule an eye exam at our Longview optometry practice, contact us today! We're only minutes away from Gilmer TX, Kilgore and Hallsville, TX.